On the initiative of the Estonian Conservative People's Party faction, the Riigikogu discussed today the sovereignty of the Estonian state as a matter of significant national importance. In his report, Chairman of the Estonian Conservative People’s Party faction Martin Helme raised the question of whether the Estonian nation is sovereign at present within the meaning of the law of democratic state and in the light of the Estonian Constitution. “The Conservative People’s Party finds that, at the moment, the state power does not respect the will of the people as the sovereign in a number of issues which means that the power delegitimises itself,” Helme said. He mentioned as examples the legitimacy of the guaranteeing of Greek debt, that is, the European Stability Mechanism (ESM), and its compliance with the Constitution, and the passing of the Registered Partnership Act against the will of the people. “Today’s practical fight over sovereignty is fought in the immigration issue,” Helme added. Helme referred to the fact that British Prime Minister David Cameron has made a proposal to the European Union countries to recover the decision-making right from Brussels and to restore the sovereignty of the Member States. “It is incomprehensible to me why we are not demanding the same things,” Helme said. Doctor of History Jaak Valge said that the everlasting purpose of our state has been formulated in the preamble of our Constitution. It is the preservation of the Estonian nation, language and culture through the ages. Valge referred to the danger of provincialisation and was concerned that instability is growing in today’s world. “Today we need sober judgment and freedom of thought unfettered by provincialism more than in our recent history. We need common goals also because, with politicians, the lack of a common goal also means inability to achieve better results through discussion,” Valge said. Lecturer at the Faculty of Law of the University of Tartu and Chairman of the Management Board of the Foundation for the Protection of Family and Tradition Varro Vooglaid said that a great part of the independence of Estonia is gone by today. “European Union law has been declared to have supremacy over Estonian law, and allegedly a greater part of legal regulation comes directly or indirectly from Brussels. This harsh reality cannot be endlessly adorned with stories of the sharing of sovereignty,” Vooglaid said. He mentioned as examples how the decision making right in financial policy has been lost to the European Central Bank and Swedish commercial banks, and the sphere of national defence has melted to become part of the global trans-Atlantic network. Member of the Riigikogu Henn Põlluaas said that statehood rests on “three whales”, namely, territory, independent legislation, and the people. “Our state power is retreating in all the three aspects mentioned above. It does not care about the territorial integrity of the state – the border treaty –, the preservation of the people – emigration and demographic crisis, – or the supremacy of the Constitution. The interests and legislation of the European Union are primary,” Põlluaas said. Põlluaas expressed his stance against passing the Act on the conclusion of a new border treaty. In his opinion, there are no political, economic or other reasons for surrendering the borders established by the Tartu Peace Treaty. Põlluaas stressed that the Estonian people have not surrendered their right to self-determination or the sovereignty of the state. “The Government has no powers to reduce, surrender or transfer them. Violation of our sovereignty and that of the other members of the European Union harms not only Estonia but the whole Europe,” Põlluaas said. Mart Nutt, Peeter Ernits, Jüri Adams, Mart Helme and Sven Mikser took the floor on behalf of factions during the debate. They all considered the sovereignty of the Estonian state important but highlighted different aspects in the maintaining and protecting it. The Riigikogu approved with 81 votes in favour (1 abstention) the Act on Amendments to the Medical Devices Act (63 SE), initiated by the Government. The Act brings the Medical Devices Act into conformity with European Union law. For that, the requirements for affixing the marking of conformity to medical devices and the requirements for notifying the supervisory authority are specified. The Riigikogu approved with 80 votes in favour the Act on Amendments to the Waste Act and Other Associated Acts (75 SE), initiated by the Government. The Act amends the provisions on hazardous waste and hazardous properties of waste in the Waste Act in connection with the amended European Union law. The Riigikogu approved with 73 votes in favour (1 against, 5 abstentions) the Act on Amendments to the Hunting Act (77 SE), initiated by the Government. The aim of the Act is more efficient hunting in order to quickly reduce the number of wild boar and to prevent the spread of African swine fever. According to the Act, it is permitted to hunt wild boar from all-terrain vehicles and other power-driven vehicles with a stopped engine, with the help of an artificial light source, and it is permitted to catch wild boar with trap fences. Analogously to killing animals that show signs of rabies, under the Act, it is permitted to kill without a hunting permit also wild boar that show obvious signs of swine fever. The Bill on Amendments to the Work Ability Allowance Act and Amendments to Other Associated Acts (84 SE), initiated by the Government. The Bill will postpone the entry into force of the Work Ability Allowance Act by half a year in order to make amendments to the passed Acts necessary for the implementation of the work ability reform. It will also be necessary to ensure additional time for implementation of the IT developments and the implementing legislation. Under the Bill, the Act will come into force on 1 July 2016. Member of the Social Affairs Committee Jüri Jaanson said that altogether 25 motions to amend the Bill had been submitted. Jaanson said that the Social Affairs Committee had abandoned the initial plan to retain the working allowance because only 53 people used the working allowance in the amount of less than 5000 euro last year. At the same time, the construction of the information system necessary for the functioning of the allowance would have required 80 000 to 100 000 euro. 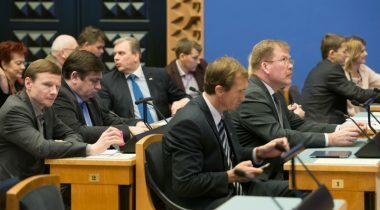 “As a compromise, the Committee made a proposal to the Ministry of Social Affairs to find budget funds for the Estonian Fund for Disabled People, in order to thereby support the people with special needs who need funds to cover a cost relating to an assignment or work where their costs are not covered from other sources of the unemployment insurance fund,” Jaanson said. The right of the insurer to obtain data from the health information system with the consent of the person will be omitted from the Bill. A section under which the unemployment insurance fund will reclaim from the insurer the amount of work ability allowance that the insurer has deducted from the compensation for incapacity for work paid to the person under the Motor Insurance Act will be inserted into the Bill. The provisions concerning the changing of the organisation of social rehabilitation, technical aids and special welfare services will be omitted from the Bill, and they will be discussed during the proceedings of the Social Welfare Bill (98 SE). In the opinion of Marika Tuus-Laul who took the floor during the debate, additional work needs to be done with the Bill. In connection with resignation of member of the Riigikogu Priit Toobal, Anneli Ott assumed membership of the Riigikogu and took the oath of office at the beginning of the sitting.